This document summarizes the TPC-H benchmark result for the System x3950 X6 that was published on 2 May, 2016. The document lists the result, summarizes the major components of the configuration under test, and provides the link to the relevant benchmark organization’s web site for details about the result. Lenovo becomes the first company to publish a non-clustered TPC-H@30,000GB benchmark performance result. May 1, 2016 ... Lenovo has published the first ever non-clustered performance result on the @30,000GB TPC-H benchmark scale. This new result showcases the scalability of the Lenovo System x3950 X6 with the latest Intel Xeon E7 processor technology running Microsoft Windows Server 2016 and SQL Server 2016. The TPC Benchmark H (TPC-H) (from tpc.org) is a decision support benchmark that projects system performance in a data warehouse environment. It consists of a suite of business oriented ad hoc queries and concurrent data modifications chosen to have broad industry-wide relevance. This benchmark illustrates decision support systems that examine large volumes of data, execute queries with a high degree of complexity, and give answers to critical business questions. The x3950 X6 achieved this record level of data warehouse performance using Microsoft SQL Server 2016 Enterprise Edition and Microsoft Windows Server 2016 Standard Edition. 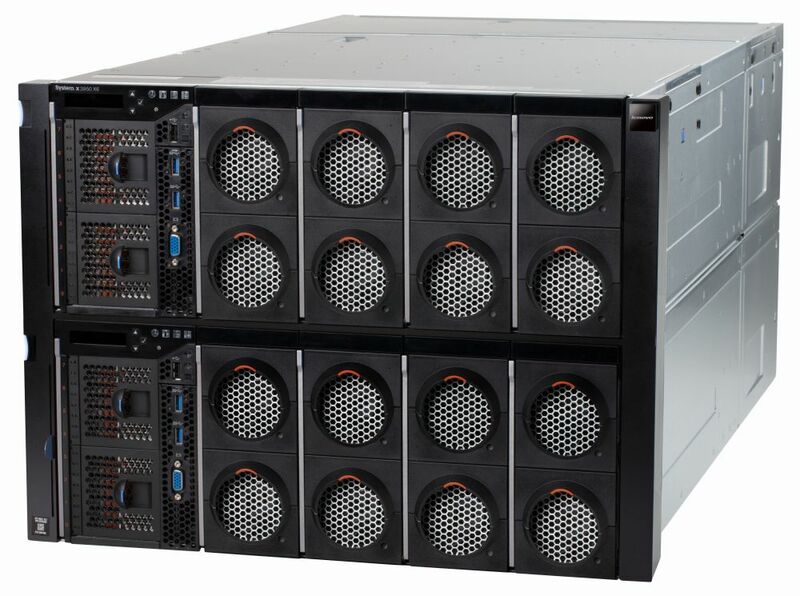 The x3950 X6 was configured with eight Intel Xeon E7-8890 v3 processors with 18 cores each, 12TB of memory and 16 Enterprise io3 Flash PCIe adapters from SanDisk. This result highlights a tightly integrated optimized Microsoft SQL Server solution on the Lenovo X6 server. This is the first ever non-clustered result @30,000GB TPC-H benchmark scale. Previously, non-clustered results maxed out @10,000 TPC-H benchmark scale. At 30TB, it is three times larger than the previous tested database, reflecting the growth of in-memory databases both in size, and popularity. The benchmark showcases the ability to process huge amounts of data using this solution. The benchmark result was made possible by the ability of Windows Server 2016 to support 12TB of memory. Windows Server previously supported only 4TB of memory while the x3950 X6 could be populated with 12TB. The System x3950 X6 is an 8-socket rack server that delivers maximum performance and availability for business-critical applications and the largest databases that customers need to run their workloads against. With system support for up to 144 processor cores, 12TB of system memory, and over 150TB of flash storage, the x3950 X6 is known for its leadership performance, and its ability to scale in order to power traditional databases as well as new in-memory database and analytics solutions. Now customers can achieve leadership solution performance by virtualizing high performance databases and applications on the same server. X6 platforms are the sixth generation of enterprise X Architecture (EXA) technology and represent more than 15 years of investment and innovation to exceed industry standards. Results referenced are current as of May 1, 2016. (1) The total solution availability for this TPC-H benchmark result is September 30, 2016. See the details for this result at this web page: http://www.tpc.org/3321. Microsoft®, SQL Server®, Windows Server®, and Windows® are trademarks of Microsoft Corporation in the United States, other countries, or both. TPC, TPC Benchmark, TPC-H, and QphH are trademarks of Transaction Processing Performance Council.